I have days, like last night, where I get home from work and I want to run. But the last thing I want to do is go back outside and be part of the world. Even on beautiful days (yesterday it was sunny and in the high 60’s) I sometimes choose the treadmill instead. Sometimes after a particularly long or difficult work day I just don’t want to be around people. So I hang out with Sven instead. Does that hint towards introvert tendencies? I don’t really think of myself as an introvert. I enjoy the company of others, but only once I’m in that company. That is to say, when I’m at home I’m perfectly content with that and am happy to just stay there. However, once I’m in a social setting, hanging out with family and/or friends, I really enjoy it. People run on the treadmill for all sorts of reasons and a lot of them make sense. The weather is unfavorable, kids/family situations, it’s unsafe to run outside by yourself, etc. But my reasons when I run on the treadmill usually don’t fall into one of those categories. I just like the solidarity of it and I like not having to go anywhere to do my run. It’s crazy, though, because I love running outside. And 90% of the time that is what I do. I think running outside is probably more beneficial than a treadmill and you get to see more stuff. 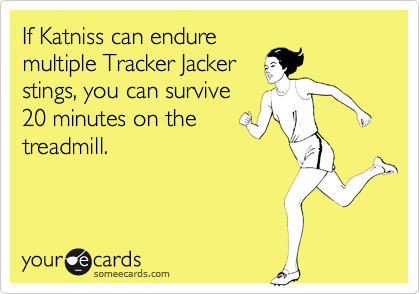 But the treadmill is a timesaver and I also like watching my recorded TV shows while I run. Except I enjoy my time on the treadmill. But I still love the Hunger Games reference. Maybe it’s just some kind of laziness, although I find it hard to associate laziness with any kind of running. It’s like telling a non-runner you’re going out for an easy 10 miler. There is such a thing, but not to them. In the end, a run is a run, and it’s better than no run at all. And if I am a bit of an introvert, or a home body or whatever, then thank goodness for ‘Sven’ the treadmill. Would you ever choose the treadmill over an outdoor workout when the weather is nice? Do you think a preference for the treadmill makes you an introvert? I like my treadmill. While I am not an introvert, I come home and don’t need any more stimulation from the outside world. I watch the news and knock out a few miles. It is also easier on the old knees and ankles. That’s a good way of putting it – no more stimulation from the outside world. Some days I do prefer the treadmill over running outside. But with our long, cold winters, I try to take advantage of running outdoors as much as possible. That makes sense to take advantage of nice weather when it’s here! I would never choose the treadmill over a run outside, but I am able to walk out my back door and hop on the trail with no worries about driving to the trail. Like you, I’m a homebody/introvert that loves the company of others! Debbie @ Deb Runs recently posted…Spring – The Time For Lighter Foods! That makes sense. I would probably run outside a lot more too if I had a trail I could get to on foot 🙂 There are just some days where I don’t want to go back out once I get home. I’m glad to find another homebody who always enjoys the company of others! I knew it couldn’t be just me. I’ve gotten a mile or two into a treadmill run and gotten off to run in the rain–and in the snow. If it’s dark or wicked cold/windy (well, maybe just windy) I’ll choose the treadmill. I’ve tried to run a few on the treadmill (like in the morning until the sun rose)and then transitioned to outside, but it made the pavement feel awful on my shins. I like the idea of it, though. I don’t think there’s anything at all wrong with a treadmill! If you prefer that type of running, go for it! I definitely prefer the treadmill to running alone in the dark. You can enjoy being around people and still be an introvert! I’m an introvert. No question. After a busy day at work I will sometimes choose to run at home (even on a nice day) just because I need to be alone. Good to hear that I can enjoy people and time alone! 🙂 Yea trails are something I thought about, too, in regard to alone time. If only they were in my backyard!